Enzo Ceccoti (Claudio Santamaria) is a small time thief living in the poor suburbs of Rome under the same roof as more dangerous criminals lead by the 'Zingaro' (Luca Marinelli) from which he occasionally accepts dirty, little jobs. On one of these, whilst escaping from the police, he accidentally trips into a tank of radioactive material and ends up gaining super powers. As a threat rises in the city Enzo has to decide where his morals lie. 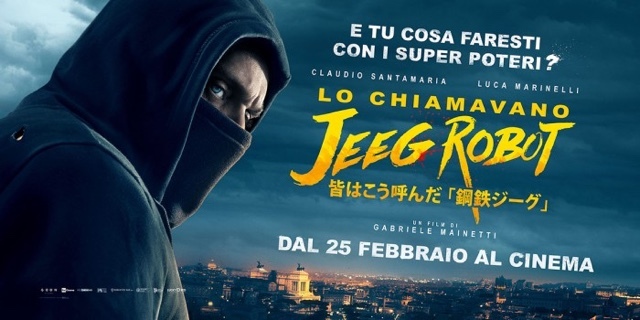 They Call Me Jeeg Robot (Lo Chiamavano Jeeg Robot is the original title) comes in as one of the first major Italian productions in the super hero genre. Whilst it can't be faulted for lack of diversity and originality, it doesn't manage to transcend genre cliches in a interesting way and because of an overall faulty execution it can be defined as a fine film on its own, yet nothing, unfortunately, remarkable in the genre. The new ideas that spark from the film are many, not all of them work and some are actually the reason the film isn't amazing, but the writers have to be commended for some tropes they manage to subvert and some beautiful touches they manage to add. Ilenia Pastorelli plays Enzo's slightly off balance neighbor and whilst the performances jumps up and down from highs to lows, the character always has something deeply touching about her. I want to avoid spoilers of any sort here, but to sum it up her dynamic was clearly thought out and executed with a pleasant delicacy that was required and hard to hit. Claudio Santamaria is actually an excellent protagonist and one of few words, which Santamaria pulls off greatly. Of all the characters in the film, his was the only one that never lost audience attachment and always gave a clear vision of his motivations and his development. His arch might not be as original as people think, actually quite the contrary, but he is brought to life with an affection and an attention to detail that makes him a character worth following. From a directorial point of view there are many things that could be said both in positive and negative side. What is interesting is to see a first time feature director bring to life such a particular vision. I don't use particular randomly because there are many tonal flaws and ideas that don't work, but there is a very solid voice in the directing and Mainetti pulls his vision off, making his world live and breathe an unusual diversity and an atmosphere that is dark and twisted in its very own way. Where the film loses steam is in some of the performances, coming admittedly from undeveloped or cartoonish characters, from plot turns that result deeply cliched and deprive the film of a depth it was hinting, but most of all the tonal shifts are all over the place and make for a disjointed experience where you lose track of where the moral balance lies. From darkly comic interventions, to full on dramatic character explosions, to comedic light moments that don't really belong where they are, these continuous shifts make the film really choppy and undermine its world building which is another element it really lacks. We don't understand where in the world the story takes place fictionally, we don't understand the rules of this land, the social climate is never clear for the audience and since it seems that the film is actually making quite an effort to make you understand it, since it plays an important role in the storytelling, the fact that I didn't grasp it was all the more underwhelming. On an action and technical level the film does have merits for managing to cope with such a small budget and making out of it something that is fully deserving of theatrical release. It shows that this is Mainetti's first feature and many edges have to be rounded off in the action department: the hits are never shown on camera. On the other hand, the director uses the handheld shot in a particularly pleasing way, making the shots breathe and giving each of them multiple beats which is always nice to see. Whilst this movie will not be remembered in the hall of great super hero films from this era it is good to see different personalities jump into the genre and give their own wild take on it even if not succeeding in a masterful execution.